Everest Base camp (EBC) and Kalapathar Helicopter Tour. 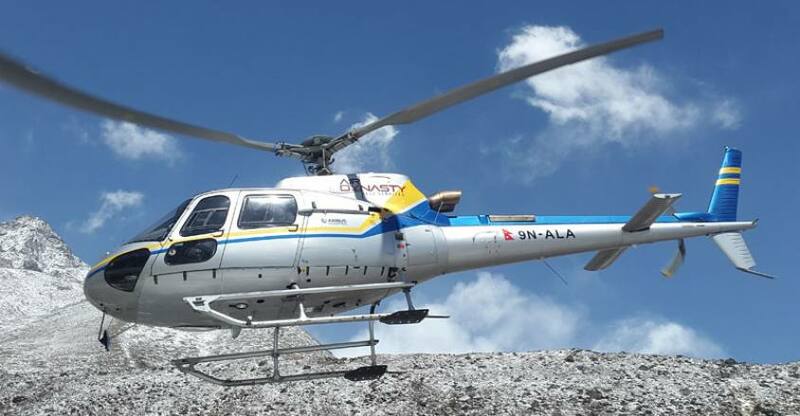 Everest Base Camp Helicopter Tour starts from Kathmandu, flying east from Kathmandu towards the beautiful Sherpa village and the gateway to Everest, Lukla. After fueling in Lukla, the flight starts flying towards Everest Base Camp (EBC)Kalapathar. The flight goes over the Tengboche, Dingboche, Gorakshep and Khumbu glacier to reach the Base camp of Everest. 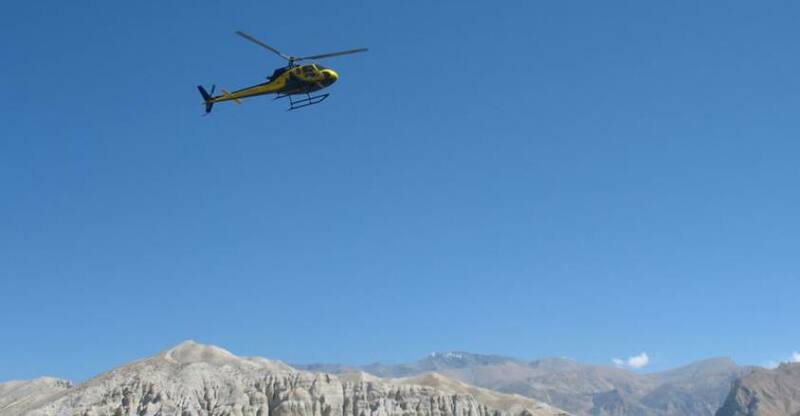 This Helicopter tour takes you as close to Mt. Everest as you can reach in a day. The helicopter flies east, parallel to the Himalayan range. A breathtaking landscape unfolds as your pilot glides the helicopter above picturesque Sherpa mountain villages (monasteries), emerald mountain lakes and a snowy expanse of Himalayan peaks and glaciers. Khumbu Himal, Ama Dablam, Kantega, Nuptse, Lhotse, Pumori, and Mt. Everest are but some of the peaks you will get to see up close. If you take this flight during the climbing season, you may also see colorful-tented camps of expedition groups in EBC. There will be a brief stopover 7(5-7mins) at Kala Patthar-5545m. From Kala Patthar, one can get the closest view of Mount Everest. You will be having breakfast at Everest views hotel or Kongde resort after the breakfast you will board the helicopter and fly back to Kathmandu. 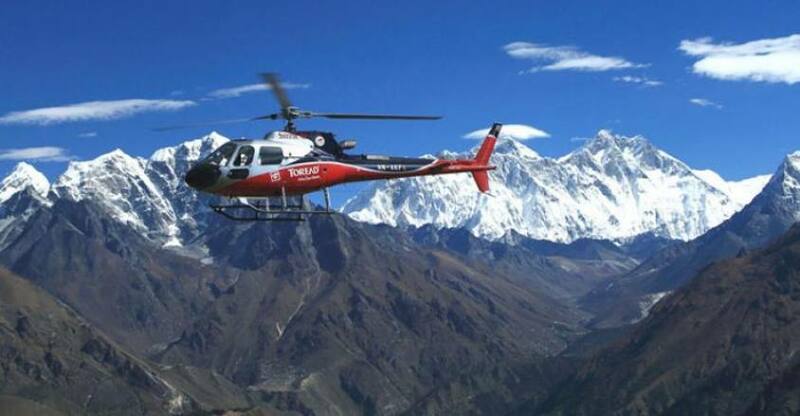 Everest Base Camp Helicopter Tour is most liked sightseeing flight tour in Nepal Himalaya among local and international travelers. This tour will prove you the lifetime exciting experience of the Himalayas. Day 01: After the breakfast fly to Lukla with Helicopter. After the breakfast drop to you domestic airport Kathmandu. Helicopter will take to you first Lukla for the fuelingthen fly to Tengboche (3890m), stop 15 minutes for tea and photograph of very closed view of Mt. Ama dablam (6856m) Thamserku (6723m), Kantega (6779m), Mt. Everest (8848m) , Mt. Lhotse (8516m), Mt. Nuptse (7855m) etc then Helicopter fly to Mt. Everest base camp (5363m) for close view of Mt. Everest (8848m) , Mt. Lhotse (8516m), Mt. Nuptse (7855m), Mt. Pumori (7145m), Khumbu Ice fall, Khubu Glacier etc then stop 15 minutes at Kala pattar (5545m) for very closed of Mt. Everest (8848m) , Mt. Lhotse (8516m), Mt. Nuptse (7855m), Mt. Pumori (7145m) then fly to Mt. Everest view Hotel (3941m) for last minute of photograph of Everest region mountains Mt. Everest (8848), Lhotse (8516m), Lhotse shar (8382m), Nuptse (7879m), then fly back to Kathmandu, transfer to Hotel. we fly 5/6 Pax from Kathmandu, we will do two shuttles with each 3 Pax from (Pheriche 4200m). If you are more than 3 there will be two flights from Pheriche to EBC and Kalapathar each carrying not more than 3/3 persons due to the elevation. This allows you to enjoy the Great views from your Seats. The Passenger Weight limit from Kathmandu to Lukla is 450 Kg’s in Total. While the weight limit is Only 210 kgs in Everest Base Camp and Kalapatthar. This is another region for making two shuttles from Pheriche for more than 3 Pax. Spending only around five minutes in Kalapathhar will prevent us from getting altitude sickness. Our helicopter will be on stand-by at Kalapathhar, therefore, it is technically impossible to spend more than the allocated time. The below-given cost is per person and one helicopter carries 5 to 6 peoples if you are grouping cost will be $1350 per person only. the below-given Everest Base Camp Helicopter Tour fixed departure dates are available for you. If the given date is not favorable then please contact us and we will happily customize your trip on dates more appropriate for you.